Of all the interest I’ve had in gardening and going through various plant phases, collecting boxwood was not one I thought I would do. It was only around the holidays that I would even pay attention to the one large American boxwood I had on the north side of the house. I use it to decorate just about everything. At one point, a few years back, I visited the boxwood collection at the United States National Arboretum in Washington, D.C. I made the trip because there was talk of removing it, so I felt I needed to see the collection before it was too late. My reaction was, so what? I didn’t get what all the fuss was about. They were just green shrubs, yet I still appreciated the formal structure they provided. The boxwood collection is still there, by the way; perhaps I should revisit with a new appreciation. My garden was designed to have the beds lined with boxwood. The vision was to create a formal chaos, with boxwood shrubs taming the wild pollinator garden. I planted the boxwood about seven years ago, and since I wanted it yesterday, I chose one that was fast growing, and also cheap and abundant. I planted Korean boxwood ‘Winter Gem’. Each year, my boxwood are sheared to about a third, mainly taking off last year’s growth. Left alone, this boxwood not only grows fast, but it can get very big. Today, the vision I had some seven years ago has been realized, and I began a growing appreciation of boxwood. So much so, I started a collection of various ones. Crazy, right? Not at all. Keep reading. 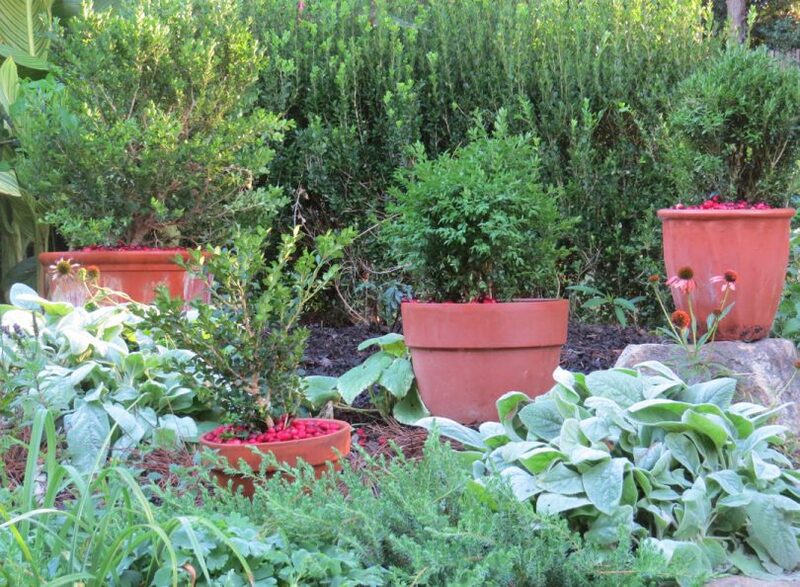 Boxwood performs very well in containers. My back porch and under the eves of the east side of the home house my boxwood collection—all in containers. During the spring and summer months, they are a no-fuss, steady statement of green. 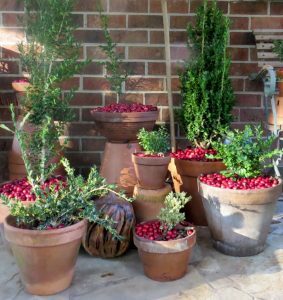 Then sometime in early November, at around the same time bagged cranberries are plentiful, I purchase about twenty dollars worth of cranberries to add as mulch to each contained boxwood plant. Pop! The color of the red and the green create a festive display throughout the entire holiday season. In fact, the cranberries remain bright red through Valentine’s Day. At that time, they are still whole, but the red begins to darken. By the time spring arrives, I either remove the cranberries and toss them into the garden to decompose or, most often, I just cover them with a fresh application of regular mulch. The botanical name is synonymous with and sometimes sold as Buxus microphylla var. japonica ‘Winter Gem’ or Buxus microphylla var. koreana ‘Winter Gem’. The light colored evergreen foliage tends to bronze in harsh winters, particularly if plants are located in open areas exposed to full sun and winter winds. For me, I found that once the plants have matured, the bronzing stopped. Among the various types of boxwoods, the Korean boxwood is most noted for having the best winter hardiness in our area. This 2 to 3 feet tall and wide shrub grows best in well-drained soil that is slightly alkaline. Use it as a small hedge or a specimen plant in sun to part shade. Give it an annual shearing, if desired. Boxwood has some susceptibility to blights and leaf spot, but has few other serious insect or disease problems. The three main insect pests are boxwood leaf miner, boxwood mite, and psyllids. Root rot can also be a problem in poorly drained soils. Rabbit and deer usually leave it alone. The fungus Cylindroclaidium buxicola causes boxwood blight. Research found the American and the English boxwood to be the most susceptible of the 23 species tested, including the Korean boxwood. There is a lot of misinformation about the spread of the blight. For us in the North Carolina, it isn’t widespread and most likely starts at the nursery. The industry is doing its part to control the spread of the fungus by removing and destroying diseased plants before they go to the garden centers, but it’s still best to check your plant before you buy. Symptoms include dark or light brown circular spots on the leaves, often with dark edges. The stems may have dark streaks, and the leaves appear a bit off-colored. If you see theses symptoms at the garden center, let the owner know. If homeowners suspect that their boxwood plants have the disease, they can submit samples to the North Carolina State University Plant Disease and Insect Clinic. The testing is free for those who follow guidelines outlined at www.cals.ncsu.edu/plantpath/extension/clinic. For more information on the disease, its symptoms and management, including information on the cultivar susceptibility trial, check out www.cals.ncsu.edu/plantpath/extension/clinic http://www.cals.ncsu.edu/plantpath/extension/clinic. Helen Yoest, author of “Plants With Benefits” and “Gardening With Confidence,” is an award winning garden writer and sustainable gardening caring for her half-acre wildlife habitat, Helen’s Haven.